This post is an overview to the guitar’s CAGED system, highlighting the diatonic and pentatonic scale shapes as the relate to the whole fret board. There are two free downloads of the scale systems as an overview: chords related to fret board to scales. This makes learning the system as a whole much easier. It is the final article in a series of articles that deal with the CAGED system, so if you missed it and want to start at the beginning click here. The CAGED is a system of chords and their related scales which helps map out the geography of the guitar’s fret board. Its strength lie in its ease of transposition. From ideas to chord progressions as long as you know which area and shape you are in it is child’s play to move into a new key. This series of lessons has been compiled into a book of lessons. It ulizes Barrios’ great arpeggio study, Las Abejas, to highlight how to use this knowledge practically. It is available online from Amazon as a digital e-reader book, or online from Rhayn Jooste’s site as a PDF download – for a paper copy. CAGED is not great for learning to solo, it is not designed for soloing. Learning licks and understanding how they relate to theory is how you get started with that. CAGED is great for memorizing chord progressions and scales, hence why it is an invaluable tool for classical guitarists. It helps map out chord changes, keys and scale runs and ideas for pieces. So below is the fretboard set out with the chords above and each scale system, diatonic or pentatonic, below it. Above we have the chord shapes and their fingerings, just to remind ourselves of their orientation. So above we have the basic arpeggio shapes across line 1. 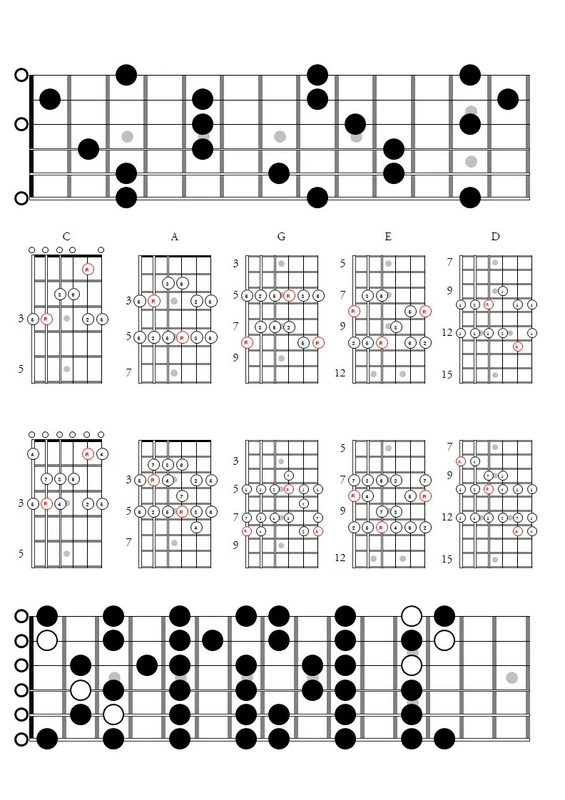 Line 2 holds the pentatonic scale, line 3 the diatonic scales and then finally the whole fretboard laid out with the diatonic scales – C and D shapes in white. Learn to move through the shapes, not just up and down. Know where the Root note of each chord shape is. Learn the modal target notes within each shape. Connect these up across shapes. Be able to place all licks or ideas onto the CAGED system. Transpose these ideas when required, makes learning them easier. And thats all folks (for now). This is the list of all the articles that build up to this final short but sweet post. Honestly if you have worked on all the previous posts this one really is only just a short visual aide de memoire, hopefully it is now under your fingers. Best tip I can give you – spend a week in each key and practice it, in patterns, across the fretboard. Then use it in songs, like really. The songs will cement it. Enjoy.